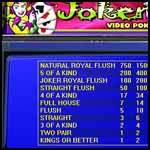 Joker Poker is another fabulous video poker game available at our casino for ladies. The object of this game is to secure a 5-card combination that will secure a win. The better your 5-card hand is, the more money you’ll be able to win. When you play Joker Poker at our online casino, you can pick which cards you want to swap. However, you can only replace your cards once. Also Poker Joker features no wild Jokers, which means that a Joker can swap any card – hence the reason why this video poker game is called Joker Poker. Joker Poker, another great game at the Lady’s Casino, utilizes wild Jokers, meaning that a Joker can stand in for any card hence the name of the game. The object of Joker Poker is to obtain a five-card poker hand that contains a winning combination. The better your hand, the bigger the payout (check the paytable on the machine first before you play). You choose how many and which of your cards are to be replaced. You may replace your cards only once per game.